The groom showed up dressed as Ronald McDonald and his groomsmen showed up dressed as McDonalds food items for the "Fetching of the Bride" stunt. And finally tonight, a happy meal for a happy occasion. Do you want fries with that ring? One bride-to-be got some when her groom and groomsmen delivered a size of supersize surprises. The stunt caused a McFlurry of laughter in a southeast Asian tradition known as the fetching of the bride. The groom is tasked with finding often embarrassing acts before they can wed. The groom didn't chicken out. We wish them many happy years of marriage. How sweet is that. It was American writer Mindy Mclaughin who said a successful marriage requires falling in love many times, always with the same person. 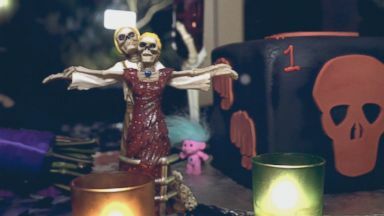 Laura Houck, of Bridgeport, Pennsylvania, plans to reuse her spooky Halloween wedding decorations for her birthday party. 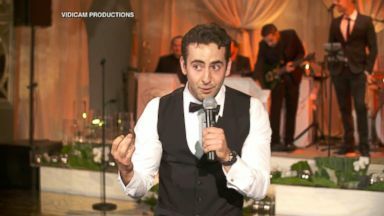 Matt Rotner brought the house down with his toast at his sister's wedding. Plus, a new study explains why it might be better to ditch the job interview. ABC's Nikki Battiste shares some of the latest trends buzzing during wedding season.